There is a world’s difference between CCIE and CCNP/CCNA certifications as to how they are perceived by everyone (the employer, colleagues, friends, and even the person himself!). There is a lot of truth to it since it is far easier and quicker to get CCNP/CCNA certified primarily because there is so much help out there in the form of study guides, study plans, practice questions what not! We can also argue that subject matter contains mostly fundamentals which also makes exam prep easier. However, getting CCIE certified is a different ballgame if you just got your CCNP or CCNA plaques! I’d say typically it takes about 6-12 months to get CCIE certified provided your are totally committed and have the fortunes of having access to the exam prep material. Let me describe the CCIE versus CCNP/CCNA comparison by using the respective official R&S exam topics! 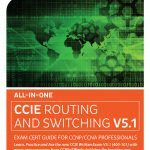 IMO, the biggest challenge that all CCNP/CCNA audience faces when it comes to CCIE written is that there is no straightforward way to jump start ones way to CCIE written exam topics knowledge base – there is no bridging material that picks up where CCNP/CCNA leaves off and guides a student step-by-step to CCIE exam topics. Well, if you are one of those CCNPs/CCNAs, we just made that a bit easier for you! We just published a CCIE R&S 400-101 Written Cert Exam Study Guide which is specifically written with CCNP/CCNA knowledge base in mind so you can jump start your prep! If you have a question, please tweet us.